To cut to the chase, Hemie fully recovered and we did compete in the local derby on Sunday. It was our first ever dressage test, then we did a combined stadium and cross country jump course. I’ll be getting photos and videos and will do a show recap in another post soon. Following last week’s tiny bit of unsoundness, we pronounced Hemie fully recovered Friday evening. I still gave him a short longe instead of a ride, just for good measure. So Saturday was our first ride in…well, one full week. I longed first of course, but he was still hot-hot-HOT. We did dressage, and all was going very well. Until we worked on a challenging exercise: bending right while tracking left on a circle. This fried poor Hemie’s brain, and challenged my physical coordination efforts in being an effective rider with all aids. 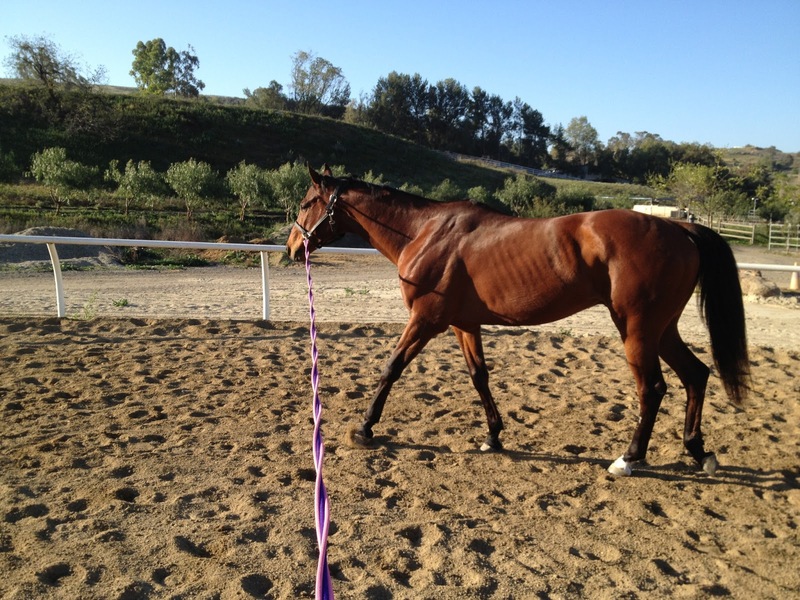 At one point he took off cantering downhill, and when I gave him a half-halt he started bouncing up and down. I got disseated, hunched forward, and basically rode Hemie’s neck as he cantered around the arena. Laurie yelled at me to drop my whip – apparently bouncing on him. Then she yelled at me to sit up, which I was already trying my damnedest to do. At some point I realized I was not going to be able to fix the situation, so I abandoned ship and rolled off his right shoulder. Surprisingly, Hemie did not run me over, or kick me, or keep running. He stopped a few feet away. I laid huddled for a minute – my abs were fully contracted and tight with pain from the effort of trying to sit up. I had my safety vest on, so that’s good. Laurie hopped on while I caught my breath, and poor Hemie went back and forth between having naughty spells in one corner of the arena to being a hard worker at the exercise in the other areas of the arena. After a bit I got back on for a few minutes, then we ended the lesson and I began the pre-show bath and tack cleaning extravaganza. Not the best pre-show ride. As to the the unsoundness last week, there’s of course no way to know exactly what the issue was, but Laurie seems to think it was hoof sensitivity. All the walking and driving paths around the barn are made of road base, which is basically gravel with chunks of asphalt. I don’t know why he’d show sensitivity now versus, say, when we first moved to the facility. But ultimately I want to be proactive about hoof health and Hemie’s comfort. So I did what many an American would do: search for a product to buy to help solve the problem. Well, actually, I already had a product in mind, but this incident was the push to actually purchase it. Its Keratex Hoof Hardener. 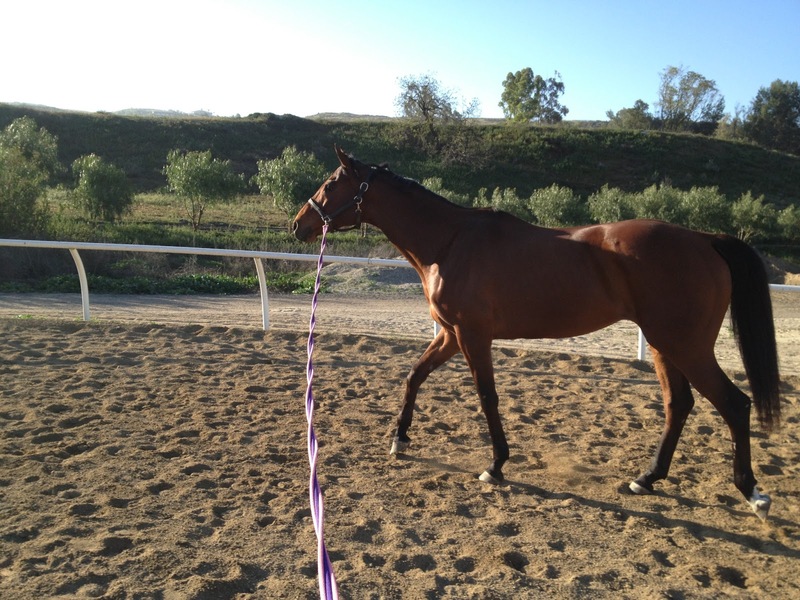 It came highly recommended by a local eventer who does Training level barefoot with great success. To my shame, she had recommended this product some time back, but since my local tack store didn’t carry it, I had bought the Tuff Stuff hoof toughener instead, and have been applying it regularly per the instructions. But I fell for a classic case of buying what’s affordable and accessible rather than what’s right (or at least, recommended by a great referral). So I ordered the Keratex on Friday and will start using that instead of the Tuff Stuff once it comes in. The Keratex can be applied to the sole of the hoof and specifically advertises for soundness, whereas the Tuff Stuff seems to be more to prevent chipping of the outer wall. For 3 times the price, I sure hope it will do the trick and prevent any more issues from arising! 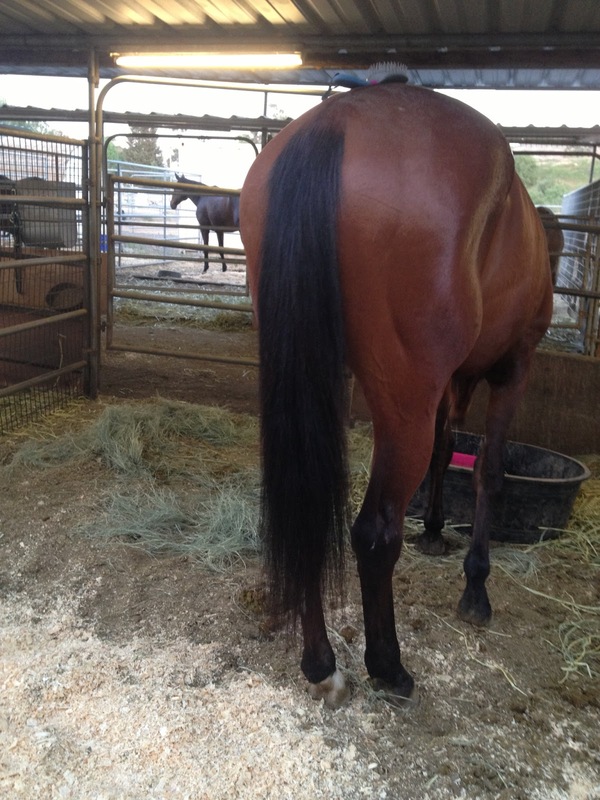 And so I leave you with a random shot of Hemie’s tail – looking much nicer than when I first adopted him almost a year ago. Tail is looking longer and fuller! I have used Keratex before and it is great great stuff. I actually put it on Hue's feet when he was barefoot. Hue already has fantastic feet for the most part but when used on other horses I saw tremendous results. Really worth the extra money. I have used the Tuff Stuff as well and just didn't find it as effective. Aw … sorry about the tumble. At our show last week, my warm up ride was less than I hoped for. I was told that a bad warm up means a great show. Hubby confirmed that by saying it's the same in the golf world. I hope your show proved the adage to be true (bad warm up = great show). Regarding the counter flexing – I really like that exercise as it really helps to loosen up Speedy's neck and ribs. It does take a lot of outside leg and coordination, but it is useful. Once you work on it slowly at home while you're both relaxed, it will be easy. Well, a bad pre-show ride makes for a good show, right? Glad you're ok! Prairie just had her bought of foot-soreness for the spring as well. I think it's just “that time” where the warmer temps and sogginess takes its tolls on otherwise healthy feet. Next year I'll be a bit more proactive in applying the hardener throughout the winter and try to stay a step ahead.. So glad you guys got through the show! Glad you and Hemie are ok!